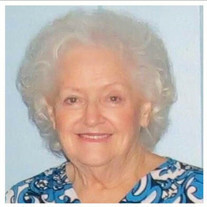 Mrs. Shirley Rosier Stalvey, 82, of Lake Butler died Monday morning, March 5, 2018, surrounded by her family and her friends, including her pastor and his wife Brother Danny and Sister Joyce Fouraker at North Florida Regional Medical Center in Gainesville, FL following an extended illness. Mrs. Stalvey was born December 14, 1935, to John Quincy Rosier and Annie Sapp Rosier, in Lawtey, FL. Mrs. Stalvey has lived in Lake Butler for the past 56 years. During her lifetime, she held positions as a Secretary at Prudential Life Insurance in Jacksonville, FL, a seamstress at the Lake Butler Apparel Company in Lake Butler, a Machinist at General Electric, Ever Ready, and Gates Battery Plants in Alachua, FL, and Union County School Bus Driver. She retired from Gates and General Electric in 1997. The positions she was most proud of was that of wife, mother, grandmother, great grandmother, sister, aunt and friend to many. She went out of her way to assist those that needed assistance, putting aside her own needs to ensure that others received the attention, love and care they needed, or desired. For the past 42 years, and up until her death, Mrs. Stalvey was a member of Trinity Baptist Church in Lake Butler, FL. She loved Jesus and her church family. Mrs. Stalvey was a woman that loved her family and enjoyed family gatherings. She raised four daughters and proudly accepted the role of stepmother to her husband's five children from a previous marriage. She was equally proud of all her children. Mrs. Stalvey was preceded in death by her loving husband of 46 years LeRoy Stalvey, her parents: John Quincy Rosier and Annie Sapp Rosier, four sisters: Sybil Griffis, Bertice Slade, Gertrude Cruce and Merle Rosier; two brothers: Bobby and Clifton Rosier; two daughters: Teresa Collins and Amy Hart; and three grandchildren: Justin and Staci Eaves, and Faith Gray. Mrs. Stalvey is survived by a great-granddaughter, Anistin Arvin, that lived with her, two sisters and one brother: Sandra Griffis, Coy Cruce and Edmond Rosier, all of Lawtey, FL; two sons and six daughters: Merrell (Evon) Colchiski of Ocala, Deborah Hart of Lake Butler, and Shawn (Keith) Gray of Texas, Franklin Hart (Tammy) of Lake Butler who was like a son to her, Roy P. (Cheri) Stalvey of Indiana, Timothy Stalvey of Lake City, Anneliese (Rickey) Stafford of Glen St. Mary, Deborah Dean of Jacksonville, Denise (Victor) Fundora of Lake City, 20 grandchildren and 15 great grandchildren, several nieces, nephews, and dear friends in Union County, FL. The visitation with family will be Thursday, March 8, 2018, 6-8:00 PM at Archer Funeral Home. The funeral will be held Friday, March 9, 2018 at 11:00 AM at Faith Baptist Church in Lake Butler, FL, with Pastor Danny Fouraker (from Trinity Baptist Church) and Pastor Keith Gray (Mrs. Stalvey's son-in-law) officiating. Interment will be at Dekle Cemetery. In lieu of flowers, contributions may be made to Trinity Baptist Church, 375 SW 6th St, Lake Butler, FL 32054.